I don’t know…maybe when you are as masterful and prolific as Mr. Spielberg has been, we start to notice little things we might have forgiven in the past. Or maybe Spielberg-ian elements have become passe. Or maybe he’s just too heavy-handed when it comes to matters that pertained to his childhood. Whatever it is, “it” got in the way of me completely enjoying a film that had most of elements that should have made the experience exceptional. Let’s start with the good. The Coen’s famously doctored the script, and, for the most part, it’s great. The dialogue always feels real and earnest – no easy feat with such an historically “important” subject. The acting, ESPECIALLY Mark Rylance, is spot on. Hanks, as ever, is Hanks (ie great). And Sebastian Koch stands out, as well, as the East German lawyer/go-between for the GDR government. 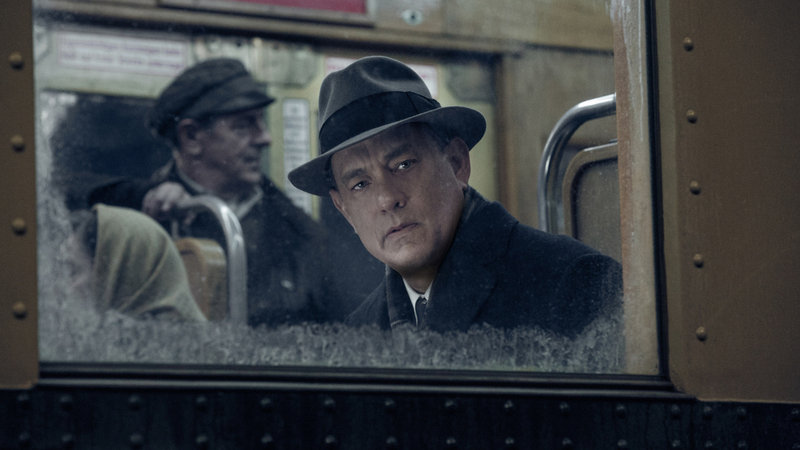 But Mark Rylance, just as he was in the vastly under-appreciated “Wolf Hall,” is all subtlety and expression and heartbreak as the presumed Soviet spy, whom Hanks must defend. But, the direction? Sloppy and over-the-top. I know, who the hell am I to take Spielberg to task? Well, there are scenes where the focus is incorrectly pulled. Other scenes that have been overtly staged for “effect” – the only effect, of which, is to take you out of the film. And then there are the historical inaccuracies. Minor, to be sure, but if you know anything about these events and these times, you will know they’re off. Finally, he pushes the “cold war” doom and gloom beyond reason. To be fair, the activities shown might be accurate, but they didn’t occur with a heavy-handed soundtrack accompanying them when we lived through or witnessed them, and they didn’t need to be here. “Stop, drop and roll” is frightening enough when viewed through the eyes of a child…we don’t need any help understanding how important it was. Finally, I have to take composer Thomas Newman to task. It’s one thing to have a signature sound to your scores. You’ll always know a Mark Isham or Carter Burwell score, even if they are completely different. But this score is IDENTICAL to the score from “The Judge”. In fact, I’m not certain the closing credits were not directly from that score. Lazy. Okay…I’m being overly harsh all around. And the film had the disadvantage of being viewed by me after seeing twenty films at the Chicago Film Fest, so maybe it was just too much Hollywood in comparison. It’s a perfectly good Hollywood flick about a very important time in our history. It is certainly worth seeing for Rylance and Hanks…and the Coen’s words. But it is not great…or really even close to great, and when Spielberg puts his mind to something, we’ve come to expect more. This time, it should’ve been less. Some good points. I really enjoyed the film myself – Rylance being the best part. I enjoyed it as well, just feel like it was close to being so much better. But, yeah, Rylance is amazing in it. Thx for the comment!